Religious Education is fundamental to the overall development of the child. 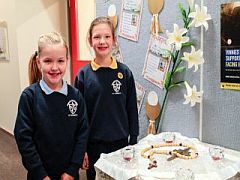 We aim to build on each child’s experience of living the faith in a Christian family, lead them into a deeper understanding of their life in the Church and give opportunities to grow closer to the wider community of the Parish family. We endeavour to equip the child with the knowledge, skills and understandings necessary to live a full Christian life. The Dominican ethos is an important focus in the life of the school being expressed visibly through our school motto VERITAS, our Vision Statement and the many activities that remind us of the Dominican traditions of love of learning, a search for truth, a development of each unique person to their full potential, an appreciation for culture and a striving for excellence. Therefore, St. Dominic's creates a learning environment that promotes student participation, thinking, decision-making and responsibility. Through an inquiry based learning approach to planning the Curriculum, students are challenged to become more aware of, and responsible to, the wider community. Our policies and programs are developed within the guidelines of theAusVELS (Australian and Victorian Essential Learning Standards) and the Religious Education Guidelines of the Catholic Education Office, Melbourne. AusVELS is the Foundation (Prep) to Year 10 curriculum that provides a single, coherent and comprehensive set of prescribed content and common achievement standards, which we use to plan student learning programs, assess student progress and report to parents. AusVELS incorporates the Australian Curriculum F-10 for English, Mathematics, History and Science. It uses an eleven level structure to reflect the design of the new Australian Curriculum (AC) whilst retaining Victorian priorities and approaches to teaching and learning. We are committed to integrating these areas which centre on the students' key developmental needs at each phase of schooling, thus providing a broad, balanced and relevant approach to learning. As our curriculum attends to the education of the whole person, we also believe it is our responsibility to promote an understanding of physical wellbeing and encourage a level of physical fitness. Emphasis is not only placed on individual physical skills, but also on the associated values and attitudes of being involved in team sport. At St. Dominic's, we believe it is our responsibility to empower students through learning so that, having gained a fuller understanding of life and the human person, they can approach their future with confidence and a greater appreciation of what life has to offer.